Gasp! When she appears… backs turn, eyebrows lift and heads nod. She’s slim, she’s trim and simply exudes confidence. Like a breath of fresh air, asparagus arrives as the very siren of spring. To welcome the seasonal change, she sports a verdant little number and her lovely spear-shaped lavender hat. Standing tall, she leads the way into our new season. All the other spring vegetables get inspired by “Inspireagus”, and confidently follow her lead. Tis’ a high bar to strive to be like asparagus, but we all should throw back our shoulders and try. More to be inspired by, is what asparagus can do FOR you. This sprout of “sparrow grass” is both looks and substance. Of its many attributes, nutrition is paramount. Like broccoli it contains a phytochemical called sulforaphane (sulfur). A substance that the famous Dr. Paul Talalay discovered helps defend the body against carcinogens. Asparagus is one vegetable that we can use for this prevention. “You will never know what didn’t happen” because you fortified yourself with this protector. It is also high in fiber which is great for your digestion, folate which is essential for pregnant women and lots of good vitamins too. Your blood sugar will appreciate glucose transporting chromium and its potassium is great for your blood pressure too. Asparagus is also a well-known diuretic making it great for getting rid of excess fluid. With very few calories this little wonder is a bargain. Not surprisingly, asparagus has historically been thought to be an aphrodisiac, and highly prized by the Egyptians and Romans. Queen Nefertiti actually did use it a food for the gods. Yes, when asparagus arrives there are “diner smiles” all around with good reason. 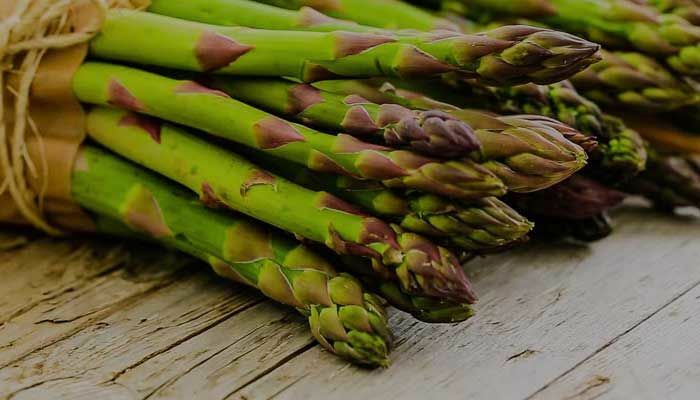 So, this spring inspire yourself with our chef’s delicious dishes and by our friend Chef Jeremy’s aspirational asparagus ideas. There is so much more to love about asparagus right here.